Published: Dec. 23, 2016 at 01:52 a.m. Updated: Dec. 24, 2016 at 11:24 a.m.
PHILADELPHIA -- By the end, Odell Beckham Jr. was spent and maybe a little at a loss, too. He crouched in the end zone, his head in his hands. 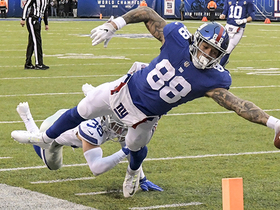 The NFL's most thrilling receiver had run out of gas, unable to summon his superhuman burst to get under Eli Manning's pass to the end zone with 20 seconds left. Of all the starts and sputters of the New York Giants' offense in their frustrating 24-19 loss to the Eagles -- which forestalled the Giants clinching a playoff berth and secured the No. 1 seed in the NFC playoffs for the Dallas Cowboys -- this was the least expected one. After the game, a visibly irritated Beckham left the field and had to be led by security to the locker room. He also was captured on camera growling to himself outside of the locker room. He later blamed himself for the failure on a play that would have given the Giants their only lead of the night -- the only one that mattered. "It was placed where it needed to be," he said. "I just need to go get it." On the next play, Will Tye didn't go get Manning's pass and it was intercepted, ending the second of two drives in which the Giants had a chance to seize the victory and simply failed -- a troubling sequence for an offense that has looked out of sync most of the season. 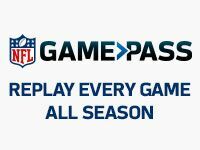 The Giants are still almost certain to make the playoffs -- a loss by Detroit, Tampa Bay, Green Bay or Atlanta this weekend will get the Giants in -- but despite their record and the two victories over the Cowboys, there can't be much confidence in how far their offense could take them. The last time the Giants managed at least 20 points was a month ago, and that was against the winless Cleveland Browns, hardly a milestone that should give the Giants comfort. On Thursday, Manning attempted 63 passes -- a career high -- and accumulated 356 yards. With its defense giving them the ball over and over, there were plenty of statistics by the offense -- including 470 total yards -- but little real production. 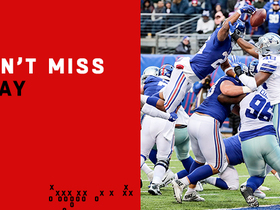 The Giants settled for four field goals. The first-quarter pick-six by Malcolm Jenkins, when Manning attempted a pass to Tye while he was double covered, spotted the Eagles seven points. For all of the anger over the phantom unnecessary roughness penalty called on Eli Apple, which led to the Eagles' third touchdown, this game was about the lack of rhythm of the Giants' offense and the baffling fact that it's simply not getting better. "Timing," Beckham said. "It hasn't been there, it hasn't been there, then the next week it's there and everything goes out of the window. It's just timing. I truly believe it will come together at the right time. But I totally believe the time is now." 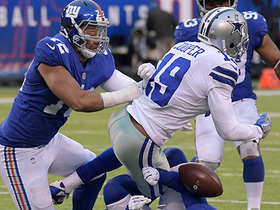 If the Giants hope to fashion a playoff run, it had better be. But the inconsistency has raised questions about Manning, who stirs hope every time he drops a perfectly placed deep pass to the sideline in his receivers' hands, as he did again Thursday night to Beckham. It conjures memories of the Mario Manningham beauty that is etched in Giants Super Bowl lore. But then Manning heaves a wobbler up, as he did on his second interception against the Eagles, and the questions return -- about his health, about his strength, about whether this might be the first stirrings of a decline. Those questions will be answered later -- the Giants have to hope much later -- but for now they must contend with the inconsistencies of an offense that rarely seems to have fully clicked and looks nothing like the powerhouse from last year. "We turned the ball over too much. The quarterback got hit too much. Not a recipe for success," was coach Ben McAdoo's clipped assessment. All accurate, but still without an answer. Manning is as even-keeled as they come, and considering the Giants are almost certain to be playing in January, there is plenty of reason to follow his path away from panic. 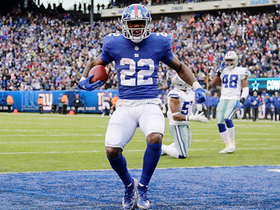 He pointed to how well the Giants recovered from their early 14-point hole against the Eagles. But when a two-time Super Bowl winner has the ball in his hands for two drives that could win a game, the expectation is that it will get done. "We expect to be able to score touchdowns and win the game in those circumstances," Manning said. Manning wondered if the sluggish start was the result of playing on a short week. Maybe so. The Giants will get extra rest now before next weekend's regular-season finale against Washington, a game the Giants likely won't need to win for a playoff berth, but which might be a necessity for playoff psyche. Manning and the offense have caught fire in playoff runs before and maybe there is another one of those in store in the coming weeks, too. "There's definitely a lot of progress," Beckham said. "You can tell this team has got what it takes. It was an uphill battle. We still fought. There's a lot of positives to take from this." So as they headed back up the New Jersey Turnpike, the Giants were left looking for silver linings. That's an odd way to start a run toward a silver trophy.